The Texas Red Beds are the finest, most gloriously complete fossil record of a critical threshold in evolution: The Dawn of the Land Ecosystem. The fossil record at this location shows us the rise of the first top predator the world had ever seen on land - as well as the many species it hunted. Kimberly Beck looks closely for tiny fossils that might lead to a new excavation site. But we didn't always know what we know now. 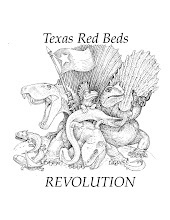 The discovery of the Texas Red Beds came late in the history of paleontological science. Dinosaurs, Pterodactyls and Woolly Mammoths were all found far earlier. But there was the immense slice of time, labeled the Paleozoic Era - which begins with the Cambrian roughly 540 mya and ends with the Permian, about 250 mya - with almost no fossil record. Museum cases had only a few bones from Russia. All that changed when Philadelphia paleontologist E.D. Cope discovered fossils in the Texas Red Beds in 1877. Not one or two or a dozen pieces - thousands of bones. Scores of species. Complete skulls, nearly every tooth in place. Entire feet, every toe perfect. Torsos and shoulders, hips and tails. Chris Flis and Johnny Castillo prepare a Dimetrodon spine to be removed from the site. About 80% of the big vertebrates (defined as having a body weight 100 pounds or more) found in the region were reptiles. The most formidable were carnivores growing up to 400 pounds, as heavy as a modern-day tiger - what would eventually be called Dimetrodon. It soon became the most well-known of all Red Beds' new species, and it ruled over a land ecosystem full of primitive reptiles. Now, as in Cope's era, the Red Beds are a harsh environment- unfailingly hot and dry, with ground water in the summer that's a nasty brew of alkali and pink mud, heated to the temperature of afternoon tea. So much calcium is dissolved in the water that a few weeks camping out could give you kidney stones. 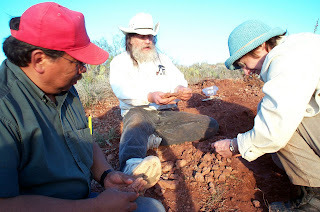 Since the Cope's discovery, dozens of scholars have braved the elements to dig into the Red Beds of Texas, and their efforts have given us 95% of all known fossils from the Paleozoic era - including many, like Seymouria, that are known almost exclusively from Texas Red Beds sites. Fossils found here continue to serve as the standard for the rest of the world. A new discovery in the Texas Red Beds. I am the Scoutmaster and Venture Crew leader here in Seymour, TX. Is there any way we could get our kids to visit the site with you some time? It would be an amazing event for them. My address is scoutmaster@scouting71.com or you can reach me at the Seymour Rural Health Clinic 940 - 889 - 5583. You can check me out with Ms. Beck. Thanks for your consideration! Dr. John Rose. I'm impressed. You're truly well informed and very intelligent. Buy Toprol Online wrote something that people could understand and made the subject intriguing for everyone. I'm saving this for future use.